A view of the Sydney Harbour Bridge from the reconstructed foreshore along Barangaroo Reserve, in the inner city suburb of Barangaroo. 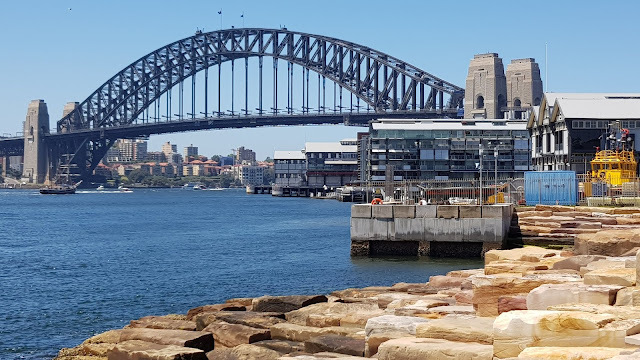 The wharves at Walsh Bay and the Operational Headquarters of the Sydney Ports Corporation at Moore's Wharf are on the right and the Southern Swan tall ship passes under the bridge. Linked to: Our World Tuesday, Tuesday Treasures, Pictorial Tuesday, Travel Tuesday. Very topical with Prince Harry raising the Invictus flag on top of the bridge this week. Fun60, I actually took this photo on Friday, the same day he did that. I am coming to Sydney (our cruise ship arrives there after visiting New Zealand, Tasmania and Melbourne) and am looking forward to seeing the bridge. This is a nice vantage view that tourists probably don't see often. We are going to stay a couple of days after getting off the ship to see the bridge, the opera house and the Tauranga Zoo. I have enjoyed seeing your photos of Sydney! Thanks, Miss Kitty. I hope you you enjoy your stay in Sydney and the sights, including Taronga Zoo. It's Tuesday at your house!!!! It's Monday at mine . . . I had to look at a calendar to make sure I hadn't missed appointments . . . golly . . Fabulous . . . Thanks to you, I've touched tomorrow! Magnificent bridge and beautiful harbor photo ! Great view of the bridge. Fabulous! I haven't seen this view of my favourite bridge before Jim, excellent!